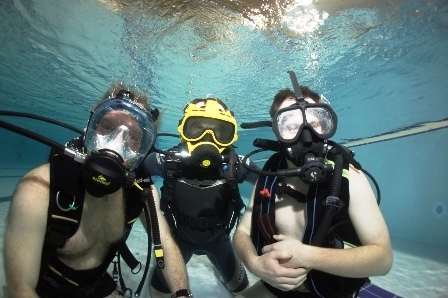 Not strictly a course report as such but instead an account of two recent club pool nights at which members had the opportunity to experience using a range of full-face masks. 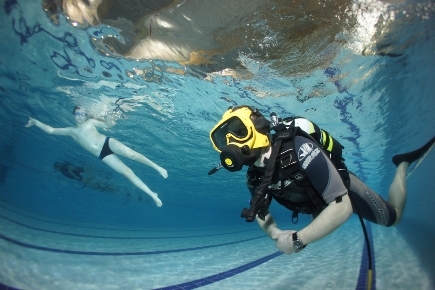 Normally associated with commercial rather than sport diving, full-face masks have a number of advantages when diving in cold or polluted waters. That said they do have disadvantages when it comes to out of air situations where you need to resort to an octopus or pony system as witnessed on one memorable occasion when a certain former member had an interesting experience with his full-face mask when he nearly ran out of air on a club trip in the Scillies…..fortunately emerging from this experience with nothing worst than dented pride…. Clearly however it’s a piece of kit which needs relevant training. 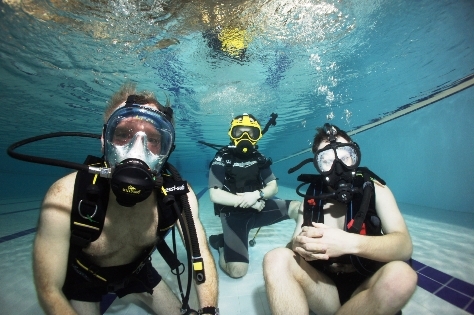 The BSAC use to offer a full-face mask course.  Indeed the equipment for the full-face mask experience was borrowed from BSAC HQ via the Regional Training team. 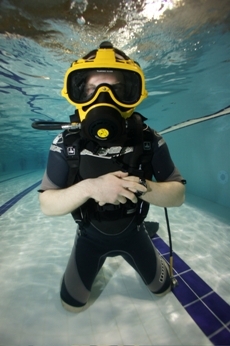 Tyneside members had the opportunity to try three different models of facemask, an Exo 26, the Ocean Reef full facemask and the Scubapro full-face mask. The Exo 26 system looks like it was designed for the rugged tough world of commercial diving. That said without exception it proved the least popular system as it was so uncomfortable to wear and use in the water. The scubapro full facemask seemed to have a tendency to steam up and drew derision from the other pool users as being something of a ‘gimp’ mask. The system that proved most popular however was the Ocean Reef full face mask mainly because it was much more comfortable to wear than the other models. At the end of the day I am not sure that any participants felt particularly inspired to rush out and buy a full-face mask system. If anything it made one appreciates the simplicity and practicality of the normal open circuit system a facemask. Nevertheless the full-face mask experience had added a bit of interest to the weekly pool night. Then again reading the local press and learning that Roker beach has lost its Blue Flag status due to increased pollution caused by raw sewage, perhaps full-face masks might become more popular with divers off the Tyne ! Thanks to Gordon Lambert for arranging the full-face mask experience.